This week's Sunday Scribblings prompt, Wings, is very appropriate. In a few hours I will be airborne, on my way to Toronto. 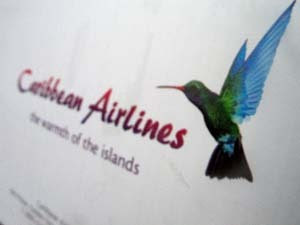 Our airline, which bears the image of a hummingbird will be taking me there. The hummingbird's wings beat extremely fast. When I was small I used to think my shoulder blades were where my own wings were meant to be, but they jut hadn't grown yet. I think my wings would be large and beat slowly. I would glide and float on wind currrents like Eagles, Vultures and larger birds do. I often wish travel could be like 'beam me up Scotty' from Star Trek. We would just say the words, dematerialize from one place and materialize in the other almost immediately. Then we wouldn't have to go through the airport rituals (filling out forms, going through customs, waiting, being on the plane, passports, hoisting luggage, etc.). I'm not fond of those pre-arrival aspects. I look forward to the moment I can put the suitcase down at my destination and know that I won't be moving again for a while as that new place becomes 'home'. I will be blogging as usual. Oh, I so agree, Elspeth! To just blink your eyes and there you are! That would be fantastic! I generally love everything about flying (except all those lines), but I would so not mind the ability to beam myself somewhere. Safe journey... Bring some sunshine with you, we need it here! This prompt seems to have come at the right time for you.